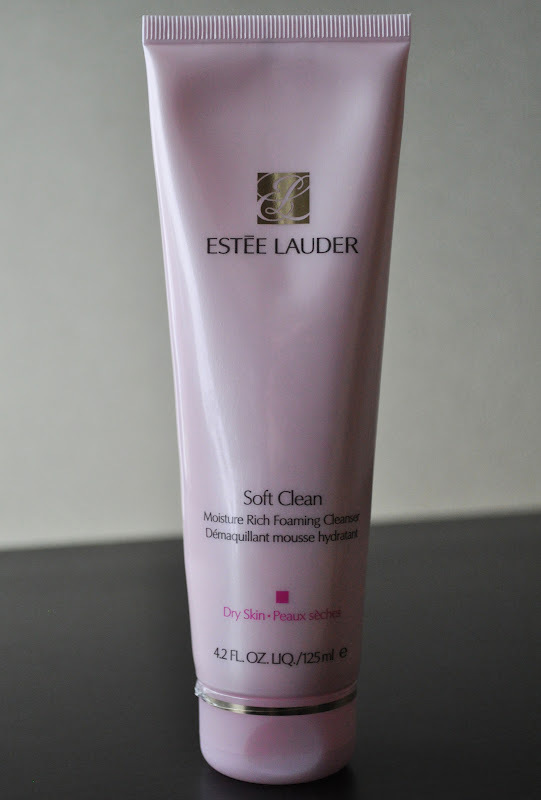 I usually rotate between three of my "I will never be without" facial cleansers and, today, I wanted to share one of them you: Estee Lauder's Soft Clean Moisture Rich Foaming Cleanser. I've been using this cleanser for god knows how long now (translation: a very long time) and I absolutely love it!!!!! Now, keep in mind, I have normal to dry skin (very dry during winter). The Soft Clean Moisture Rich Foaming Cleanser keeps my skin from feeling dry and tight; instead, it leaves my skin feeling (and looking) smooth, clear, moisturized, and clean. This cleanser has a pleasing fresh floral scent that's not abrasive. The texture of this cleanser is velvety thick and lathers into a rich foam that washes off easily leaving no residue or stripping the skin of any moisture. You only need but a teenie tiny about of this product. If you use a pea size amount...you've used too much!...so, a 4.2 fl.oz/ 125 ml tube will last you eons. My final thought/word on Estee Lauder Soft Clean Moisture Rich Foaming Cleanser is that I love it, need it, can't be without it! I've gone through 6 tubes and I'll continue to repurchase. If you have normal, dry, very dry or even combination skin, I would recommend you give this facial cleanser a try. Estee Lauder Soft Clean Moisture Rich Foaming Cleanser retails for $20 (4,200 yen in Japan...talk about price hike) and can be purchased at esteelauder.com, nordstrom.com, saks.com and wherever else Estee Lauder is sold. What are some of your favorite facial cleansers and what type of skin do you have? Hi! Love all of the make-up posts, especially the looks...so creative and helpful! Recently, I've noticed my facial and eye creams just aren't cutting it anymore. I'm at a loss in searching for new products...could you perhaps suggest a good anti-aging cream for face and eyes in your next post? Thanks! Keep up the good work! Your blog is the BEST!